As the Accidental Locavore, I play around with a lot of recipes, things that catch my interest for a myriad of reasons. 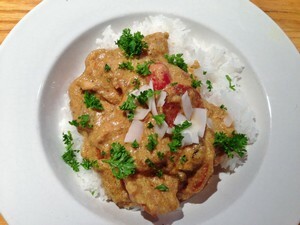 This curry has a lot of quirky ingredients that I respond to and it was pretty easy to make. It’s from Tasting Table and I adapted it to feed 3-4 people. Pat dry the chicken thighs with a paper towel. Salt and pepper them. Put the cornstarch on a plate and dredge the chicken in it, patting the cornstarch to coat both sides evenly. In a Dutch oven or pot, big enough to hold everything easily, add 1 tablespoon olive oil and heat over medium-high heat until the oil is shimmering. Add the chicken and cook, without moving it, until it’s lightly browned on one side, about 5 minutes. Turn and cook the other side until browned, about another 3 minutes. Transfer the chicken to a plate. In the same pot, over medium heat, add the remaining ½ tablespoon of olive oil, the onion and ginger and cook, stirring occasionally, until the onion is soft but not browned, about 6 minutes. Stir in the curry powder and cayenne and cook for about 30 seconds. Add the coconut milk, potatoes and the partially cooked chicken. Stir to combine. Bring to a simmer, reduce the heat to low, cover the pot and cook for about 35 minutes until the sauce is thick and the chicken is cooked through. Remove the lid from the pot, add the tomatoes, chorizo and olives. Cook for about 3 minutes until everything is warmed through. Serve over rice, garnished with the parsley and coconut flakes with lemon wedges on the side and enjoy! My verdict: This was rather disappointing. The idea of the chicken with the chorizo, tomatoes, coconut milk and olives was intriguing, however the end result was a bit ho-hum. It was better a day later when the flavors had time to mellow a bit. While it was cooking, I added more ginger and cayenne in an effort to tweak the flavor of it. Unfortunately, the interesting ingredients got lost in the mix. The original recipe had whole chicken thighs (still boneless and skinless) which were just too unwieldy. If I make this another time, I would definitely add more tomatoes, olives and chorizo (which I might cut into ½” rounds and then quarter). I’d absolutely replace the parsley with cilantro and possibly the Yukon Gold potatoes with something more starchy (they seemed to melt into nothingness). So, why am I writing about an only so-so recipe? Well, for curry lovers, this could be a good starting point and not every meal is a big success – more about that coming soon.